Oysters. There’s no disguising the fact that they come from the ocean. They have a distinctive, chewy texture and briny taste that you either love or hate. But are they good for your health? Oysters. There’s no disguising the fact that they come from the ocean. They have a distinctive, chewy texture and briny taste that you either love or hate. At restaurants, they often come on a glittering bed of crushed ice, like little watery tongues in the mouths of their pearly shells. Some people like them doused in hot sauce or with a squeeze of lemon, but whatever the preparation, you might wonder: Are oysters good for you? Do they offer any health benefits? There are some surprising benefits, especially for women over age 40, according to Julia Zumpano, RD, LD, a dietitian in the Preventive Cardiology and Nutrition Program at Cleveland Clinic. “Older women can really benefit from these minerals, especially copper and zinc,” she says. With age, men and women alike can become deficient in vitamins and minerals. They may not eat enough foods containing important nutrients or an illness or medications can affect their body’s ability to absorb vital nutrients. Turns out, oysters are a rich source of important vitamins and minerals while being particularly low in calories. In a serving of six medium-sized oysters, wild or cooked, you’ll consume less than 50 calories. Even breaded and fried, which we definitely don’t recommend, six medium oysters still only contain 175 calories. “Oysters can really pack a nutritional punch,” Ms. Zumpano says. When it comes to these shelled beauties, people often have other interesting questions: Are they alive when people eat them? How should you prepare them? And the question everyone really wants to know: Are they really an aphrodisiac? So, no, they aren’t alive when people eat them, just possibly raw or cooked. If you make them at home, Ms. Zumpano offers a few cooking suggestions. 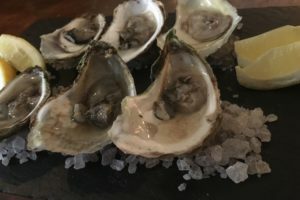 The question of whether or not raw oysters could cause sexual arousal has lingered over the years. However, there is little, if any, scientific support for this assertion. So why have oysters been so long associated with romantic lore? Perhaps, because oysters are high in zinc — a mineral important to sexual health. Oysters may, in fact, fill a nutrient deficit that contributes to impotence in some men. While there’s no evidence that oysters will enhance your love life, you might eat them to love your body, and to give it good fuel.